What is a Kumlien’s Gull? Most birders, including the American Ornithologists’ Union, accept Kumlien’s Gull as a subspecies of Iceland Gull. 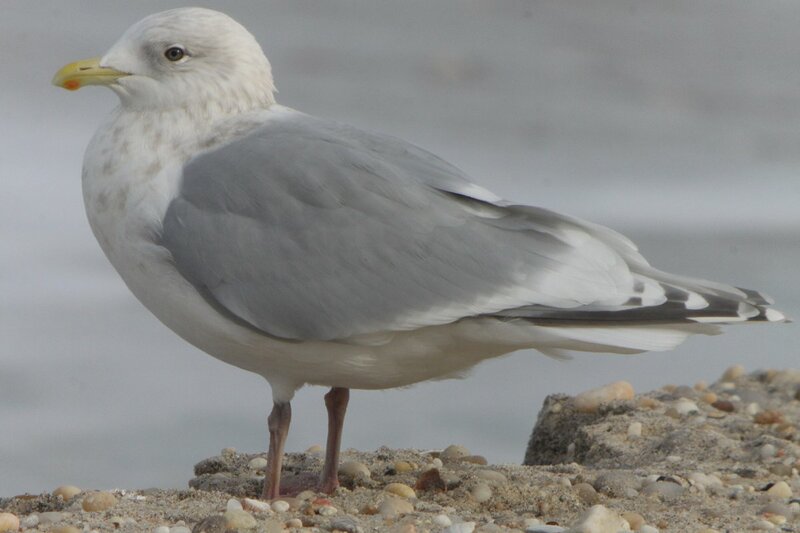 Others say that Kumlien’s Gull is a subspecies of Thayer’s Gull. Still others say that Thayer’s Gull, Iceland Gull, and Kumlien’s Gull are all a single species and we all are kidding ourselves by pretending otherwise. What the heck is going on here? The taxon is pale in all plumages, with a remarkably variable amount of pigment in the primaries. 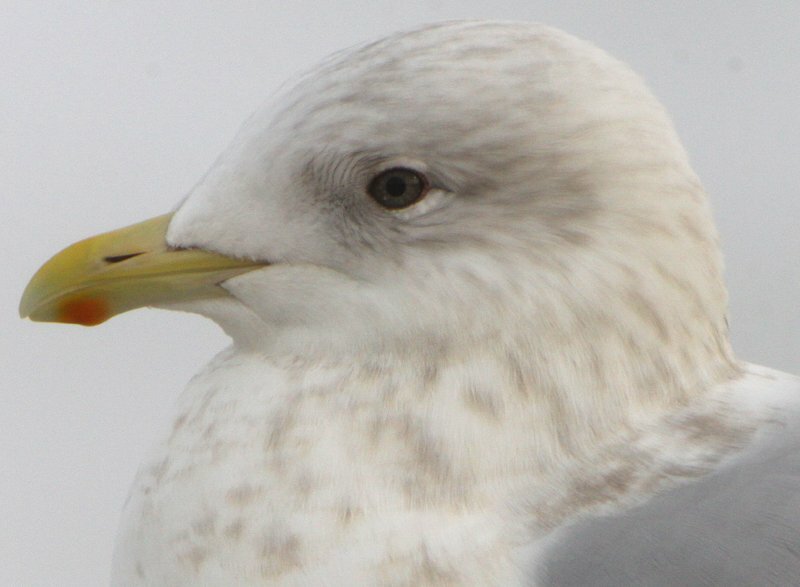 Individuals range from completely white-winged (indistinguishable from nominate glaucoides Iceland Gull) to so much dark in the wings as to be indistinguishable from Thayer’s Gull. Eye color is also variable, from pale yellow to dark brown. Such remarkable variation seems to lend credence to the belief that Kumlien’s Gull is in fact a hybrid swarm. Kumlien’s Gull also has whitish underside to primaries and a proportionately smaller bill than Herring Gull, but differs from Thayer’s in yellow iris, paler mantle and more silvery primaries usually with inconspicious dark grey or blackish outer webs and subterminal bars confined to outer 3-4 primaries; moreover, tips of outer 2 primaries are extensively white. 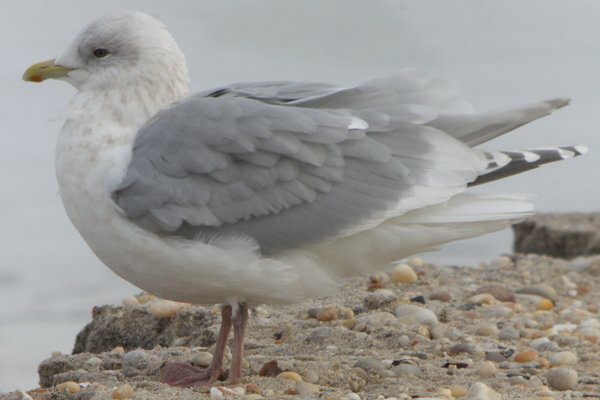 The published and specimen evidence clearly indicate that Thayer’s Gull is not a distinct biological species. The ’new school’ of taxonomists, such as Richard Snell, treats Thayer’s as part of the Iceland Gull complex, but would not give it subspecies ranking because its clinal characters vary geographically at different rates and in different directions. I recommend following the traditional treatment of Godfrey (1986) that lists three subspecies of the Iceland Gull: nominate L. g. glaucoides, L. g. kumlieni, and L. g. thayeri. The two approaches used by Snell and Godfrey are not incompatible. We could classify Iceland Gulls as Type I (glaucoides-like), Type II (kumlieni-like) and Type III (thayeri-like). Regardless of how we classify them, they are no more or less identifiable in the field. The AOU is bound to change its position as more authors independently adopt a taxonomy recognizing that Thayer’s is a form of the Iceland Gull. Does your head hurt yet? Yeah, me too. Here, let’s look at some more images of a Kumlien’s Gull and pretend that it is just a pretty birdy that won’t make us think too much. Much better, right? And as to what a Kumlien’s Gull actually is, well, hey, look over there! It’s an Ivory-billed Woodpecker riding a Great Auk! If you liked this post and want to see more great images of birds why not explore our page of photo galleries, 10,000 Clicks? Since I’ve missed Thayer’s during my days in Michigan, I naturally doubt it is a valid taxon. The best part of this is that genetics will provide no answers – most of the large white-headed gull complex in North America are genetically inseparable. I’ve even read where Iceland gull could be a sub sp. Of Herring Gull. If Iceland, Kumlien’s, and Thayer’s gulls are genetically inseparable, and their physical characteristics are clinal without consistent differences, I think that argues for merging into a single species. Not sure how true this is, but I heard that the type specimen for Thayer’s Gull turned out to not even be a Thayer’s Gull. Part of the problem is that no one really knows what’s going on at the breeding colonies. They’re way up in the Arctic and not well understood. (See this thread.) Let’s mount a 10,000 Birds expedition to go up there this summer and figure it out! I have been on Pontlyffni Beach, Gwynedd ,north wales /looking at what I was told is a Kumlein’s Gull. I was told it was identifiable due to no black tail feathers but all the photos I have seen on the net have these? I am really confused though I bow to the superior knowledge of the twitchers gathering to see the bird as I am very much an amateur birder.It seems that this is the first sighting in Wales so feel very privileged. Unfortunately I wrote on my blog that it was an Iceland Gull so I must correct this before I am vilified by the local birders! 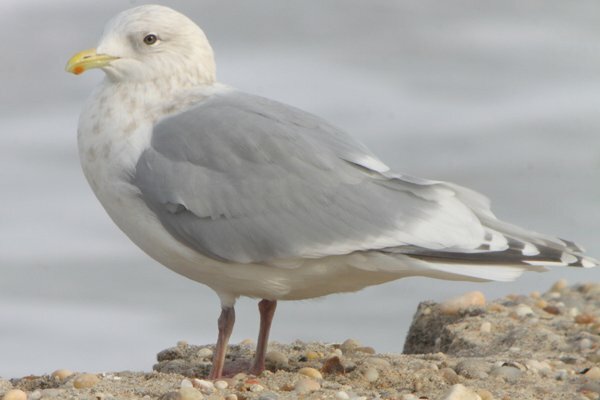 For those who are interested, a Kumlein’s Gull is staying at the beach of the port of Zeebrugge,(Seabruges), Belgium (from 15/01/2012 till…). But after reading this article I do not want to waste any energy on this subspecies till the ornithological unions have figured out the taxonomic status of these birds ? Those days it is a trend to lump and to split species. As long as there is a scientific base (genetics) for it I don’t mind but some ornithological unions do it prematurely based on several plausible reasons. Very informative post. I found it while researching the species for a blogpost I was doing. I recently same my very first Iceland gull at the Jordrey state fishing pier in Gloucester. However, my photos are nowhere near as good as yours! What a conundrum this species causes! MY word! I sure hope someone gets this one figured out fast! What is a Sabrewing in the Hand Worth? Sabrina Didn’t Make the American Idol Top 12?! ?